Conventional bench press allows you to strengthen your chest and shoulders, but when done with bigger weights, it contributes to elbow, forearm, wrist, and shoulder pain. Therefore, it can cause missed reps and interfere with the execution of other exercises. 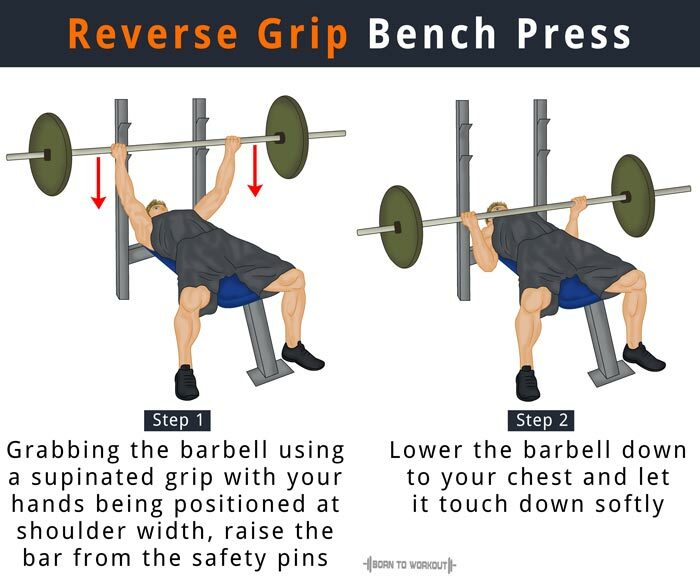 The reverse grip bench press is a viable alternative because it takes pressure off the shoulders while working your pectoral muscles. Therefore, it is an easier and safer exercise to perform than the standard version of the bench press. Set the spotter arms or safety pins at a suitable height so that they are level with the chest when you position your body on the bench. Place the barbell on the safety pins. Position yourself by lying down on the back and firmly planting your feet on the ground. Hold the barbell using a supinated or underhand grip with your hands being positioned at shoulder width. Keeping a slight arch in your back and avoiding your elbows to flare out, press the bar up. It is the initial position. Maintain control of the barbell throughout the movement to lower it down to your chest and let it touch down softly. Pause for a moment and then raise the barbell back up. Do the required number of repetitions. Do not hold your feet up or move them around. Keep them firmly placed on the ground for better stabilization and balance. When pressing the barbell up, do not keep your elbows locked at the top position. Maintain a bend in the arms so that you can easily control the weight. Make sure that the weight does not bounce off the chest.